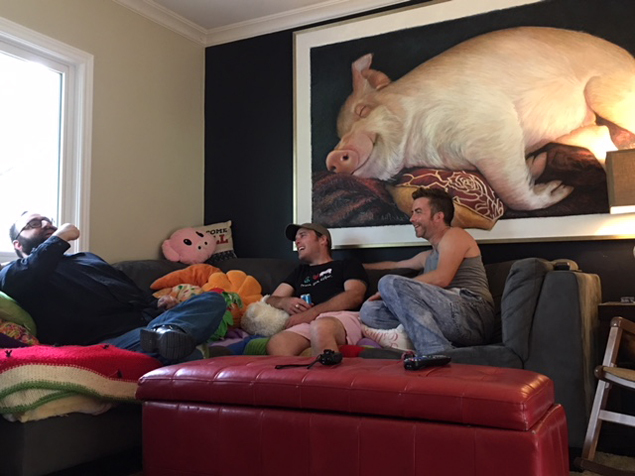 Before my fiancée introduced me to Esther the Wonder Pig — figuratively, not literally — I never could have seen myself trekking all the way up to Canada from my home state of Pennsylvania, future in-laws in tow, to meet a sow best known for a presence on Facebook and Instagram that has earned her an adoring fanbase (including my soon-to-be betrothed). Now that a month has passed and I've returned from my trip to the Happily Ever Esther Farm Sanctuary, where she lives, I find it difficult to eat any meat products without cringing — literally, not figuratively — at the thought of what exactly I'm putting into my body... and, for that matter, my soul. But first, a word about Esther. If you follow veganism, animal rights or simply adorable animals on social media platforms, you've probably heard of this particular pig. Adopted by a Canadian couple named Steve Jenkins and Derek Walter when they thought she was just a mini-pig, she quickly grew into a hefty hog weighing over 600 pounds. As they will tell you many times if you meet them in person, Steve and Derek quickly fell in love with her, and like so many of the men and women who befriend animals in the digital age, they found themselves taking cute pictures of her and placing them on the internet. Before long, their porcine passion became a vivacious vocation; the pair have subsequently published three books, befriended a number of celebrities (I'm particularly jealous that they know Ricky Gervais) and opened up the aforementioned Happily Ever Esther Farm. And, of course, there is still the Esther the Wonder Pig website; click on it and you will find photographs of the titular character dressed to the nines or lounging in bed, chowing down on her preferred snacks (cupcakes are ubiquitous) or cavorting with her various other animal friends. Oh yes, there are other animals — a fiercely protective turkey named Cornelius and a crafty chicken named Richard, a majestic horse named Escalade and an endlessly playful dog named Phil (who at one point happily pounced on our camera when he mistook it for a chew toy). And many, many other pigs of course: Captain Dan, whom Steve and Derek obliquely hint may harbor amorous feelings for Esther; Leonard, who exudes sweetness even when you're watching him from behind a distant fence; April, who plays mother pig to a number of young piglets; among others. It's important to identify the individuals here because, in their own gentle way, Steve and Derek have a message that they want to send you. When you eat a meat product of any kind, you aren't just putting the remains of "livestock" in your body. Whether you are comfortable admitting it or not, the meat once came from an individual creature, with a mind and personality and (if one believes in such things) a soul of its very own. It's easy to dismiss this observation as tree-hugging nonsense or unprovable gobbledygook when you haven't actually spent time with animals like the ones on the Happily Ever Esther Farm, but it's impossible to resist that conclusion after you've been there and interacted with each of them yourself. "The word 'livestock' has a whole bunch of clouds around it," Walter told Salon (after this reporter made the mistake of referring to the residents of the farm as "livestock"). "We're thinking about individuals and we're calling them 'stock,' like a can of corn on a shelf. The commodity of farm animals has created sort of this barrier where we're disconnected from what we consider our companion animals — the animals that we love, the animals that we sit down with at home and invite into our home — and the animals we consume, and consider them to be food animals. So there's this huge line down the middle that exists, and when we get to meet the animals here, the residents, we realize that they're all individuals. They have names, they have likes and dislikes, they have a chart like you'd see at a hospital. They have routines." Esther, in particular, seems to consciously enjoy her celebrity status — and trust me, I am not anthropomorphizing her. "I think she is fully aware of what's going on," Jenkins told Salon. "It's really funny the way she behaves on tour days and work days. When there's a big group of people out, she almost always pops out to say hello to them. And she comes out, does the same routine: She'll come out, she has a pee — I mean, that's just part of the routine of going outside — but then she always goes, usually, straight to her pool for a swim. Lays down, has a sit in the pool for a few minutes, and then she sits up, and it's like she poses for a few minutes, and then she heads back in the house. It's very, very predictable what she does when she goes out and there's a group of people there." By contrast, Esther's habits are much more casual when she knows her fans aren't there to watch her. While Jenkins made it clear that we shouldn't overstate her awareness of what exactly a "fan" or a "camera" means, he pointed out that she does have an intuitive awareness that her behavior should be different when she is around a crowd or has a lens pointed at her. She may not be aware of the fact that she is a celebrity, but she certainly knows that when people are paying attention to her, she has a "job" to do. Not that it's just the star of the show who draws attention. Both Jenkins and Walter marveled at how even animals that they initially didn't find particularly interesting, like chickens, show themselves to be highly individualized when they're at the farm — and wound up intriguing them immensely as a result. "We get them here and you actually watch them and they're like two little gangs," Jenkins remarked. "Chickens have the most complex social structure and it is incredible to watch it and you can never predict what's going to happen," Walter added. "You're like, 'There's Richard and his gang over there, and look there's Elvis over there with his ladies.' There is so much going on in their little heads that you'd never think of until you just allow them out to do their own thing." He mused, "Once you see them make their own decisions, you're like 'Hey, these guys aren't all the same. They're individuals.'" It seems almost crass, when discussing such happy matters, to bring up the devastating reality of what it's like for most animals. Certainly Jenkins and Walter try their best to keep things light on their farm and to avoid shaming people who eat meat (they stressed me to how they promote a positive, inclusive atmosphere on their website and social media platforms). As an omnivore myself, I appreciate that open-minded attitude... and yet there are certain realities behind our animal consumption that a morally responsible person cannot ignore. If you're a commercial pig in the United States, for example, you can expect to spend your life in a crowded factory, according to the ASPCA. When you are a piglet of two to three weeks old, you will be ripped away from your mother, put in a large windowless shed and forced to live out your remaining days in a pen where you can barely move, can't engage in natural behaviors like rooting and have to breathe in ammonia from the massive quantity of pig feces beneath you on the slatted floors. If you're a sow (like Esther), you will be kept in a gestation crate where you are literally too big to turn around and will be artificially inseminated over and over again... that is, until you are no longer fertile and thus sent to be slaughtered. All of this to an animal that scientists agree is incredibly intelligent — comparable to a dog, even. Other farm animals don't have it any better. Chickens are bred to be morbidly obese, so much so that they often can't stand up, and live in overcrowded sheds where they are forced to continue eating until they can be slaughtered. Turkeys are bred to be disproportionately breast-heavy and have been bred to be so large that they are unable to naturally mate with one another, requiring year-round artificial insemination. Cows that are raised for meat, while still largely living outdoors, are frequently branded, castrated and dehorned without painkillers, and still usually spend their final months of life in crowded areas surrounded by their own waste. Dairy cows also frequently experience tremendous pain due to the agricultural practices employed to make them constantly produce milk. Unless one is totally devoid of empathy, it is impossible to read stories like this without feeling at least a twinge of guilt. Surely even those of us who eat meat should insist that animals lead happier and healthier lives until the moment they are slaughtered, right? Because we live in a capitalist society, of course, that notion seems practically verboten — it is cheaper to let animals suffer than to accommodate their happiness, and in a free market economy we are instructed to believe that "more profitable" equals "better," lest you be branded as socialist swine — but it would seem to be common moral sense. A strong body of scientific evidence links excess meat consumption, particularly of red and processed meat, with heart disease, stroke, type 2 diabetes, obesity, certain cancers, and earlier death. Diets high in vegetables, fruits, whole grains and beans can help prevent these diseases and promote health in a variety of ways. Like I said, I hate to get so heavy-handed when writing an article about a wonderful creature who brings joy to millions of people. At the same time, if we lived in a society where the so-called "livestock" (a term I now deplore as much as Walter) was treated with basic compassion, I wouldn't need to be a downer about a subject that could otherwise be uplifting. Esther the Wonder Pig could continue her goofy antics in a world filled with other pigs just like her — happy and healthy and loved, each extraordinary because they are individuals but not, emphatically not, because it's so rare for any pig to live a happy, healthy life away from a factory farm and a premature death. This is what should be. Perhaps it's unrealistic, but if we stop aiming for what's good simply because it's not plausible, we lose touch with that part of us which makes us capable of even thinking that being a human is so darn special in the first place. The smart, scary animal rights message in "Jurassic World: Fallen Kingdom"
Matthew Rozsa's review for the pro-animal rights film "Jurassic World: Fallen Kingdom"